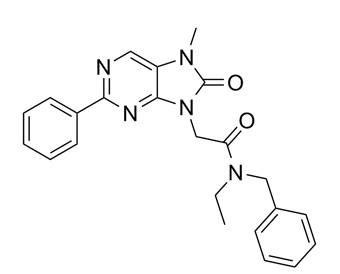 Emapunil (AC-5216, XBD-173) is an anxiolytic drug which acts as a selective agonist at the peripheral benzodiazepine receptor, also known as the mitochondrial 18 kDa translocator protein or TSPO. This protein has multiple functions, among which is regulation of steroidogenesis, particularly the production of neuroactive steroids such as allopregnanolone in the brain. In both animal and human trials, emapunil produced fast acting anxiolytic and anti-panic effects, without producing sedation or withdrawal symptoms following cessation of use. Emapunil is also used in its 11C radiolabelled form to map the distribution of TSPO receptors in the brain.
. Costa B, et al. Translocator protein as a promising target for novel anxiolytics. Curr Top Med Chem. 2012;12(4):270-85.
. Rupprecht R, et al. Translocator protein (18 kD) as target for anxiolytics without benzodiazepine-like side effects. Science. 2009 Jul 24;325(5939):490-3.
. Qiu ZK, et al. The antidepressant-like activity of AC-5216, a ligand for 18KDa translocator protein (TSPO), in an animal model of diabetes mellitus. Sci Rep. 2016 Nov 25;6:37345.